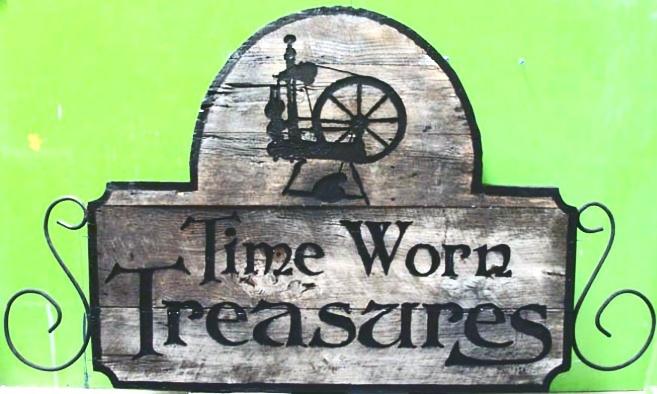 Shown above is an antique-look distressed wood sign for an antique store, "Timeworn Treasures". This sign is carved from 100 year old barnwood, engraved, and airbrushed with a gray stain to give the uneven color.It is clear-coated twice with a flat (no-glossy) clear so it can be used indoors or outside. We attached the wrought iron scrollwork after the sign was completed. This sign can be hung from a beam or a scroll bracket or mounted on a wall adjacent to a door.